Today I came across this really awesome quote by Byron Katie via TDL (The Daily Love). Reading the quote automatically reminded me about the many lessons presented to me about self-love, and how I placed emphasis on other people liking me or me needing their approval. To a certain extent, I think innately as humans, as social creatures, we naturally want people to like us. While we may act tough, walk around with a negative attitude as though we don’t need anyone to like us, I think it is important that people like us. I think its validating…I think its a recognition that in some way, we are doing something right because other people like us. The trouble comes in when we place too much emphasis on other people liking us. Many of us have had periods in our life where we have felt alone. 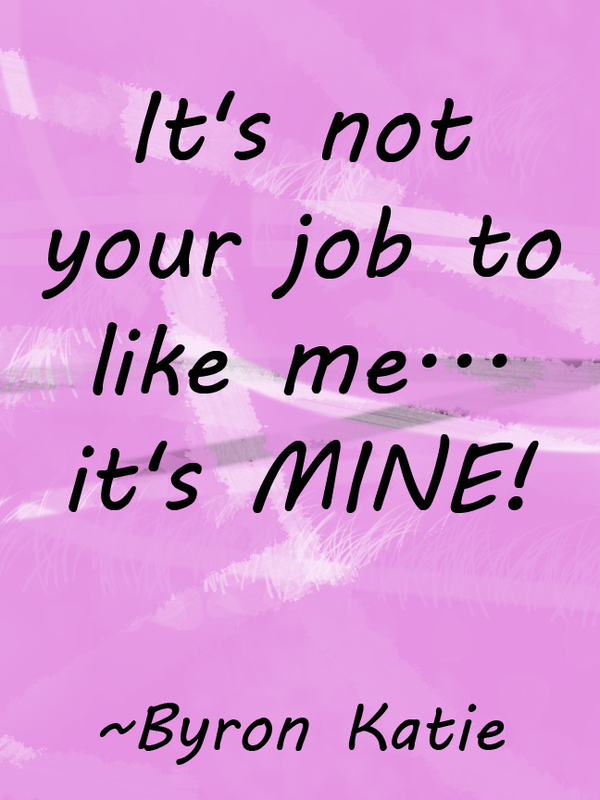 As children we may have cried out and said “nobody likes me!” But we have to begin to think that when we are at a place where we feel that others don’t like us, we need to understand that it is OK for other people not to like you. It’s their business, not yours. You have to live your life in accordance to what is valuable and important to you. Many of us fall victim to living our lives to accommodate and please other people (mothers, fathers, siblings, supervisors, significant others, friends, etc.) while totally neglecting what makes us happy. We make the choice to do things to please others. We do things in accordance to what people like while disregarding what we like to do. When we live our lives based on what other people think they know what we should be doing, or how we should be living out our lives, we begin to lose pieces of ourselves with each act that we do for the sake of someone else. Live your life authentically, and those who are supposed to like you will be naturally drawn to you by your authenticity. I recently went out with a friend for lunch and after there went to a book store. While waiting in line to purchase my items, she said to me “We should do this again Di, you’re one of my few friends that doesn’t always want to go out to drink.” I was touched by that, because on the outside, it may appear to others that I am boring because I like to go to bookstore (quite often actually), but to my friend, she saw me for me and recognized that I was being my authentic self. I live my life according to what makes me happy and what is satisfying to me. I will admit that it is a struggle and I can get sidetracked with accommodating how other people feel, or how they may react to certain things that I do or how I decide to live myself, but our lives were designed by the universe to always be in the state of learning, especially about ourselves. We are not “know it alls” and there will not be a point in your life where you will have all the answers. When you feel like you have all the answers, then you haven’t been asking the right questions. At the end of the day, literally, I have to be able to look in the mirror and be OK with who I am. It really is my job to like me, to love who I am as a person, and to be OK with the decisions that I’ve made for the day. 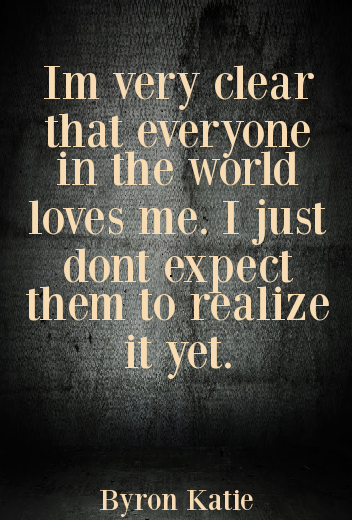 It is not the responsibility of anyone else to like me. You can choose to like whoever you want. Mastin Kipp of TDL wrote in one of his blog posts that one of the most disempowering choices that we can make is to allow other people’s thoughts to define who we are as a person, and that goes for whether or not they’re judging us or praising us. Don’t let the views of others succumb to who you think you are, or who you think you should be. You are You. Love You. Trust You. Hug You. You are beautiful. Give yourself permission to thrive. Let go of what other people think about you. Don’t worry about other people not liking you. If you are the person that you want to be, people will be guided towards you. I’m a living testimate of that. I have great friends and family who support me and are drawn to my “weirdness” because I am me. Mastin posted some questions on his blog that are very reflective and can get you thinking. Take some time and answer them honestly to yourself. Where in your life do you allow other people to define your choices? Who are the people you allow to define your choices? Why is what this person or people think about you more important than what you think about you? What has allowing this person or people to define your choices cost you up until this point? If it didn’t matter what these people thought and you got to decide, what new choices would you make now?